This 1959 Oldsmobile Ninety-Eight four-door sedan wears the optional Colour-Accent Wheel Discs that co-ordinated with body paint. It was billed as “so totally new…so typically Olds!” For the second year in a row, GM’s mid-priced luxury liner was completely original; new from the ground up. Oldsmobile’s low, sleek lines were the result of a crash programme undertaken by designers. Once they had seen the breathtaking 1957 Chrysler lineup, everything currently under development in the Oldsmobile studio was immediately scrapped. 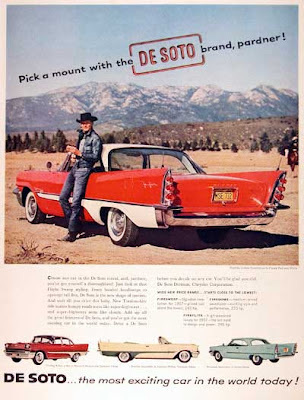 Chrysler Canada's De Soto was Oldsmobile's direct competition. The 1957 De Soto was breathtaking. The 1959 Oldsmobile 98 Convertible. Very widely spaced headlamps were moved from the fender into the dumbbell-shaped aluminum grille. This gave Olds a much slimmer front end. A slab sided profile carried a heavy eyebrow crease that wrapped around from the headlights and ran along the top of the front fender until it disappeared at its trailing edge. The 1959 Oldsmobile Dynamic 88 Holiday Sport Coupe was at home in snow. Chrome jet-look ornaments were poised for takeoff on the front fenders. From their tails, highly stylized “flares’ of jet exhaust were captured in the sheet metal. They swept dramatically rearward, nearly forever, in sharply defined fins that were capped with a complex ovoid and trapezoidal taillights. The 1959 Oldsmobile 98 Sportsman. From the rear, the envelope was given a gently sloping rear deck that ended in a long, narrow concave lip. The word OLDSMOBILE was spelled out in the depression and higher lines wore finely ribbed brightwork under the lettering. The gas port was concealed in the centre of the rear bumper. Consumers could choose from a full half-dozen Rocket Engines for their 1959 Oldsmobiles. Owners could choose engines with six different horsepower ratings: 270, 300, 315, 394, 410 and 435. All were derived from the 90-degree, high compression V-8 mill whipped up by Oldsmobile’s engineers. 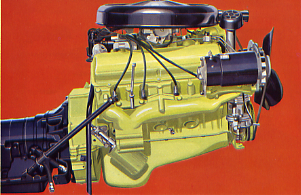 For 1959, engines were given a new Free-Flow intake manifold, larger intake valves and a redesigned automatic choke created especially for buyers concerned with pinching the beavers on their nickels at the filling station. This is one Oldsmobile styling exercise that was scrapped. While a Synchro-Mesh manual transmission was standard equipment on Dynamic 88 and Super 88 series, there was the self-shifting Jetaway Hydra-Matic transmission for ease in driving. Wheelbases grew longer. The junior Oldsmobiles were now 3 124 millimetres (123 inches), sharing their B-bodies with Buick. 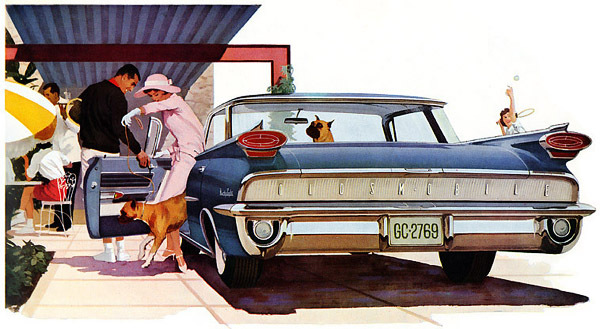 Senior Olds were assigned to a 3 200-millimetre (126-inch) wheelbase, sharing C-bodies with Buick and Cadillac. Trunk space was now a whopping 64 percent larger than before. The 1959 Edsel, from Ford, competed against Oldsmobile. The 1959 Olds was blessed with a new Guard-Beam chassis. Consumers were told they would enjoy gliding along on the strongest, most stable frame in the company’s history. U-channel and box-member side rails were mated to a huge centre x-member. It promised to reduce vibration and deliver an unforgettable “Glide” ride. The chassis couldn’t take all the credit, a wider stance and a new king pin angle improved roadability, too. An Oldsmobile could be ordered in sixteen different Magic-Mirror colours, of which many were “hi-metallic.” There was a proliferation of trendy two-tone variations for those who desired them. All of the paints were of a space-age, durable acrylic-base finish. Ford of Canada brought back the Monarch in 1959 to compete with Oldsmobile when its Edsel failed to live up to sales expectations. 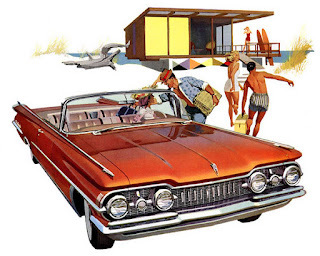 Four series filled out the Oldsmobile range: The top-of-the-line Ninety-Eight Holiday was available as a swanky two-door hardtop called the SceniCoupe, a posh four-door sedan and a very ritzy convertible. The Super 88 Holiday cost a little less and offered a SceniCoupe hardtop, a four-door Sport Sedan and a Fiesta four-door station wagon. 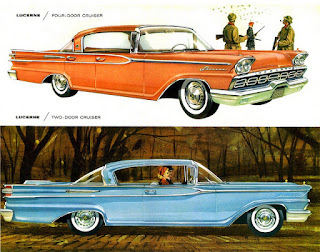 A pair of lesser trimmed Super 88s were available, too; a four-door sedan and a convertible. For the budget minded, there was a quintet of Dynamic 88 Holiday offerings including a SceniCoupe two-door hardtop, two and four-door sedans, a Fiesta four-door wagon, and a low-bucks convertible. Oldsmobile’s Twin-Contour Instrument Panel was high style for 1959. 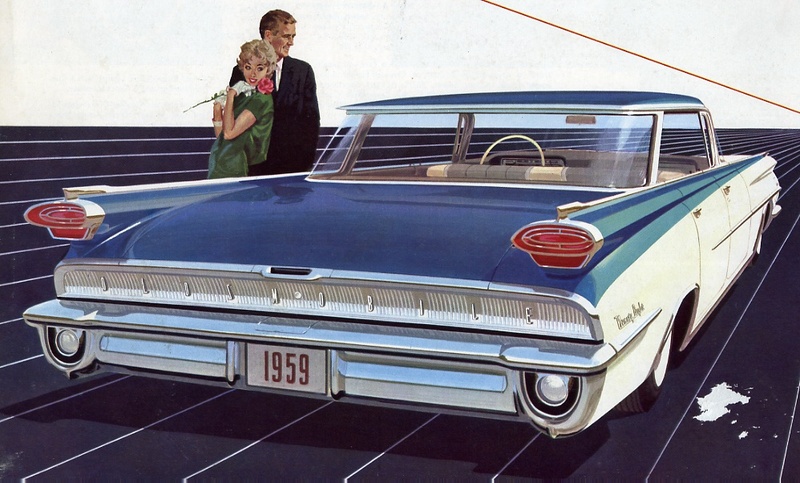 The Vista-Panoramic Windshield was 46 percent larger than in the 1958 models. Designers gave great attention to the cabins. Passengers sat in a newly enlarged “margin of comfort.” A Twin-Contour Instrument Panel gave owners a larger glove box and placed controls and gauges in front of the driver. A Safety-Spectrum Speedometer used “a new colour bar to replace the old speedometer needle.” From 0-35 miles per hour (ancient Canadian units of measure) the colour bar was green. From 35 to 65 miles (60 to 100 kilometres) per hour, the bar turned amber and at speeds above 65 miles (100 kilometres) per hour the colour bar turned red. Upholstery in the 1959 Oldsmobile Super 88 SceniCoupe exuded luxury. 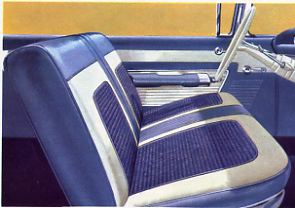 Fashion-Firm seats were “ruggedly upholstered” in the Dynamic series, upgraded to “special upholstery and rich trim” a.k.a. Morocceen and given padded twist carpeting in the Super 88 series. The flagship 98s were upholstered in hand-buffed leathers and promised to be in “good taste” for those who required elegance. Safety reflectors were built into the arm rests so that an oncoming driver could spot an open door at night. There were as many options for Oldsmobiles as there were Diefenbaker Tories sitting in the House of Commons in 1959. Roto-Matic power steering, Pedal-Ease power brakes, a power convertible top, a Six-Way power seat and an electrically controlled radio antenna were a good start. Then there was Air conditioning, a Dual-Range Power Heater, Colour–Accent Wheel Discs, trim rings, electrically operated Wide-Arc Wipers, an adjustable dome light and a De Luxe five-tube radio with Wonder Bar Station Selector and a convenient foot-operated pedal for changing stations. For high quality listening pleasure, there was the Bi-Phonic Speaker System. 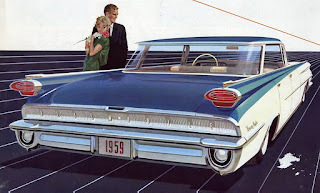 The 1959 Oldsmobile Super 88 Fiesta wagon offered eight more inches of cargo space than previously and featured a new electric rear window. Power Window Lifts were optional and--on Fiesta wagons, convertibles and all Ninety-Eights--two extra buttons could be installed to operate the Venti-Pane windows as well. Advertising called it “the ultimate in power assists.” Wagons could be had with a novel, new, extra cost, power rear window that operated by a key from the rear or with a button on the instrument panel by the driver. Other neat “advanced accessories” included a dash-mounted Autronic-Eye that automatically dimmed headlights for oncoming traffic and the Safety Sentinel, an orange light built into the speedometer that flashed annoyingly should the driver exceeded the pre-set speed limit. The Trans-Porter all-transistor radio was a unique Oldsmobile option. 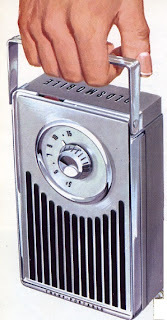 The ultimate option had to be the Oldsmobile Trans-Portable Radio, a completely transistorized, light, compact radio that operated on the car’s electrical system or on its own 160-hour battery. When not in use, the radio stored neatly on a lockable tray in the glove box and was said to be“double locked” for safekeeping. Sales brochures made no mention of the New-Matic air suspension ride for Canadians, though it was available on American Oldsmobiles. General Motors of Canada started the model year with 1,280 dealerships for its six divisions. Its payroll was $93 million and 21,000 people were in its direct employ. On December 12, 1958 the company marked a milestone as the 3,500,000th passenger car rolled out the doors of the Oshawa plant. This is the view of a 1959 Oldsmobile most often seen by other drivers. Production records show that 16,270 Oldsmobiles were built in Oshawa during the 1959 model year. That was a healthy increase over the 13,124 units produced in the 1958 model year; a year of economic recession. Records show that the climb was long term, too. In 1957, a total of 14,177 Oldsmobiles were built by workers at GM Canada. As a result of a 114-day strike, only 7,986 units produced in 1956.